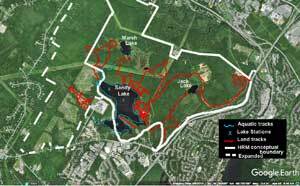 In the late spring of 2017, I was asked if would do a “flora survey” of Sandy Lake and Environs for the Sandy Lake Conservation Association as part their efforts to protect the ecological integrity of the area. I was hesitant to do so just because of other commitments, but a single visit convinced me that it had to be done. I conducted field trips on 22 days over the period June 14 to Nov 1, 2017; a few were mostly on water (paddling), most were on land. It was a volunteer activity, there was no payment and no contract. and waypoints. Some were traversed several times. I took many photographs, recorded notes as short videos, and made various measurements as detailed under Methods. This website constitutes a report on what I observed and my interpretations together with some integration of related documents produced by many others. It is also intended to serve as a resource for others pursuing interests in the natural history of the area. The website/report won’t be fully drafted for some time, but as of Jan 15, 2018 the website will provide at least an overview, with some details. 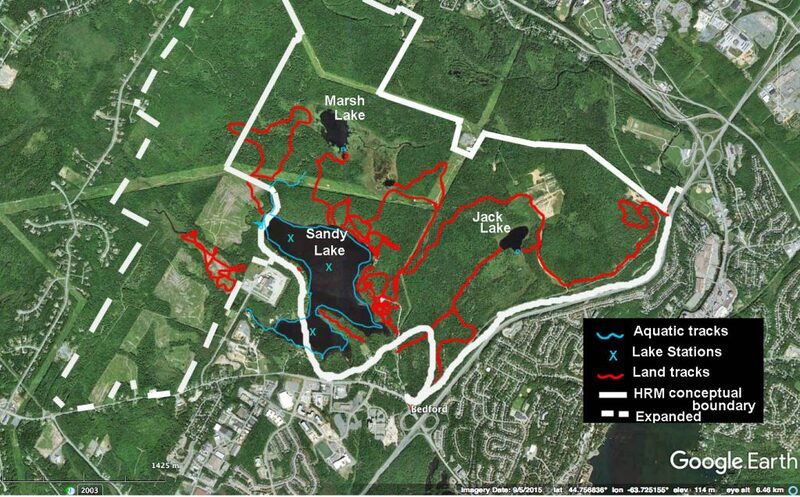 There is a lot of prior documentation of the state of Sandy Lake and Environs (see Links). Mostly what this study contributes is a description of the plants and plant communities that you see when you visit the area. Additionally, measurement of some limnological variables provides some update on the state of the surface waters. I took close to 10,000 photos. Selections of the photos are posted in Google Photo albums which are given as links on this website. I expect my explorations and the website to be ongoing, as my enthusiasm for Sandy Lake and Environs only increased during the course of the initial exercise. Sandy Lake and Environs are only a 20 minute drive from my residence on peninsular Halifax (at least when I’m going against the traffic which I usually am). I view Sandy Lake and Environs as they were viewed in 1971: an asset to all of Halifax municipality, indeed to the whole province. I see it as a very special place, complementing not replicating other major natural assets of Halifax. Hopefully this website will make it clear why.